I've had a very up-and-down relationship with the Artemis Fowl books. I was enthusiastic about the first book. Though I loved Holly Short in book two, I thought there were issues with point of view. Third book...disappointing. Evidently I didn't even want to write anything here about the fourth book. With the fifth book, I was happy again. Happier, anyway. It appears that I missed book six and wasn't crazy about book seven. Was there a book in which Artemis went into space? Oh, well, the series/serial is done now, and the wrap up, The Last Guardian, is quite good. We do have the choppy story line in which we swing back and forth between worlds/characters, which has appeared in earlier books. The side trip regarding Foaly's wife seemed totally unnecessary, for instance. It did give us a chance to be with Foaly, though, and who doesn't like Foaly? I also liked Artie's little brothers. Does anyone else see potential for an early reader series about criminal genius preschoolers? 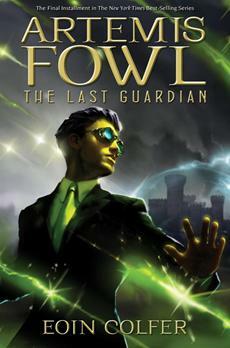 The Artemis Fowl books are fantasy thrillers with humor, and with this concluding volume we are provided with a big thrilling threat for Artie to overcome. I think the actual ending of the book gives readers a chance to have their cake and eat it, too, which I'm not complaining about.